Meet Ms. Ruby Barley – the woman who gave us Barley Woods! Our newest community, Barley Woods, was built on the heartwarming story of Mrs. Ruby Barley, the original owner of the land. She and her husband raised their children here, built two homes here, and made many wonderful memories on this land. Her children played in the woods, inventing games and picking berries, while she listened lovingly from her home. After her husband died, Ms. Barley began to think about what she might want to do with her lot. Raising a home full of children was a breeze, but eighteen acres of land would be a lot for one woman to care for! 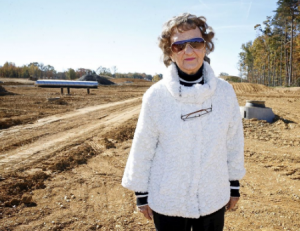 Although many developers and agencies approached her about the land, Mrs. Barley only trusted one – Roger Glover and Cornerstone Homes. Roger knew of the cherished memories Mrs. Barley had here. He would only bu y if she was absolutely certain that she was ready to sell. A recent article in The Free Lance-Star featured Ms. Barley and her 10-year journey with Cornerstone. Mrs. Barley’s stories played an essential role in the community’s unique plan. Cornerstone will maintain much of the site’s rural character, emphasizing orchards and nature trails alongside resort-style features, like the clubhouse and pool. Mrs. Barley is happy that the land she has called home for decades, will now be a place for so many active adults to make their own memories. If you’d like to learn more about Ms. Ruby Barley and her relationship with Cornerstone, you can check out this video from the ribbon cutting.